​Penny Watson has run away from her past, hoping to never return to it again. She spends her days being the housekeeper to celebrity Brock Foxx. Things change when photos are snapped by the paparazzi when he treats her to a friendly dinner. Brock Foxx has been acting for as long as he can remember, but with a nasty scandal in the headlines, he isn’t sure what’s left of his career. After one photo is taken of him and his gorgeous housekeeper Penny looking smitten with one another, a new web of lies is started. Only these lies he wants to become the truth. Before long, Penny is swept up in the spotlight as Brock Foxx’s latest fling. While she should be loving it, she’d also worried that the men she’s running from will find her. 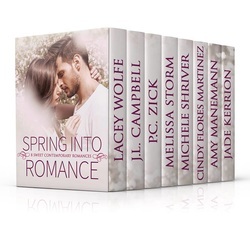 Get Cleaning Up Love in the Spring Into Romance boxed set for 99 cents!!! “You’re always so quiet. Why?” he asked. This was a question she was familiar with. Even as a child, people always asked if there was something wrong with her or if she was mute. She learned at an early age to shut her mouth, unlike her older sister who argued, even as their father beat her. Melinda never stopped, which made it that much worse. Her cheeks warmed. Brock was a smooth talker and called every woman beautiful—or she hoped. There was no way he’d pay her any attention. Especially not now. Her hair was in a messy bun, and she was still her pajamas. She was wearing a T-shirt that had seen better days. “It’s your day off. This is my mess today.” He winked. Listening she was good at. Brock pulled his phone from his pocket and tapped away on it before handing it to her. She stared at a photo of him with an expression that said ‘love’. The photo under it was her, with a similar look. Did someone Photoshop these? She scrolled down reading a short article about wanting to know who the mystery woman was that had Brock Foxx falling head over heels in love. She handed the phone back. “Me?” How could she possibly help? “Brock, just spit it out.” She had to hear him say it, because she had a really good idea where this was heading. “Oh, I don’t know.” She couldn’t be in the spotlight. She stood from the stool and walked out of the kitchen. When she got to the back door of his home, she ran toward the guest house. Once inside her small place, she knew what she had to do, pack her things and quit. That was the only option. There was no way she could do what Brock was asking. Things had been good here. She’d been hiding out, staying safe. But if he thought she had money, he’d find her in a heartbeat and do whatever he had to until she paid him.